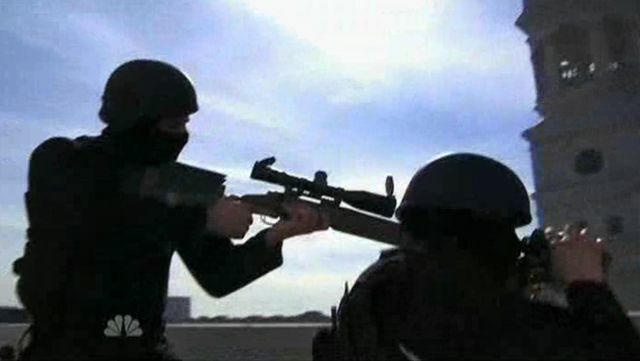 The opening recapped some of the events leading up to this episode. We saw the satellite explode in space just after it sent a message to the home world. 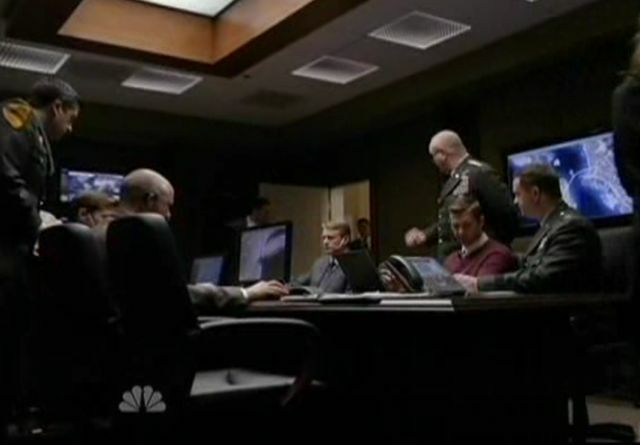 The ‘War room’ with General Armbruster (Blue Deckert), President Elias Martinez (Blair Underwood) , Blake Sterling (Zeljko Ivanek) and their speculation of what is to come of the detainees, especially Sophia Magiure (Laura Iness) and Thomas (Clifton Collins Jr.). They also recapped James Dempsey (Hal Holbrook) and that odd tabletop thing, which looks a lot like a map. I felt it bore a resemblance to the Nazca Plain in Peru. Today, “A Message Back” reveals what is happening to their home world. 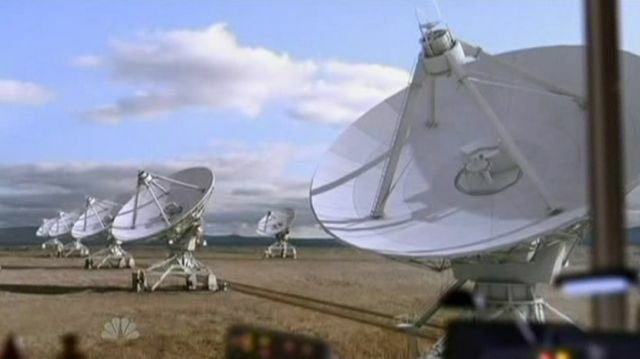 This episode opens with two operators at a satellite ground base. Thes3e characters are interpreting the new message back and we could feel the excitement one of the operators felt. As he was getting ready to alert their supervisors, his partner shot him in the head and then called Thomas. Nothing was revealed that we could hear, but the expressions on their faces tells us the news was not in any way good. We see Dempsey and his female companion at a playground/Park, watching children playing. They are fixed on a dark haired girl dressed in a purple sweater and holding a little aquatic net. “The girl in the purple sweater” says James Dempsey (Hal Holbrook). “Are you sure?” she asks . “Oh, yes…” says Dempsey “She’s one of the Special Ones” He continues: “I’ll be leaving for the airport soon, I’d like her in our possession by the time I get back”. “Of course, Dr. Dempsey, I’ll make sure we have some of the extract waiting for you” She affirms. Calling him “Doctor” is telling us a bit more about Dempsey. Possibly he is in genetics, microbiology something to do with our aging and what he may have found within the Hybrid children? At this point they both watch as the child drops her little net from a play bridge. The female companion goes and retrieves it for the little girl, asking if it was for catching butterflies. “It’s for catching turtles.” Says the child, “They live in the pond over there”. “I bet there are a lot of turtles in there that would like to come home with you” said the lady. “Really?” the child said “Sure” confirmed the woman, “Everything has to leave home sometime” …I found that statement rather telling, was she perhaps referring to the aliens having to leave their home? Or possibly preparing the little girl for an upcoming kidnapping? 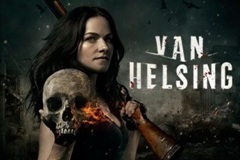 Next, we see Vicky Roberts (Taylor Cole) coming home. She notices a broken window and reaches for her gun and Sean Walker comes out of the shadows with a gun to her head threatening to place her son and mother at risk if she doesn’t disclose who she is really working for. She starts to tell him how Dempsey was behind the attempted assassination of the President and how Dempsey is a very powerful Billionaire who no one can stand up to. 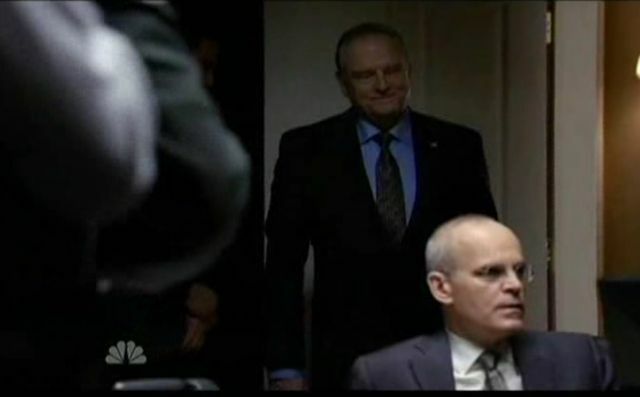 We see the “war Room” as President Martinez, General Armbruster and the others discuss what to do about the detainees, when Ray Jarvis walks in to applause. 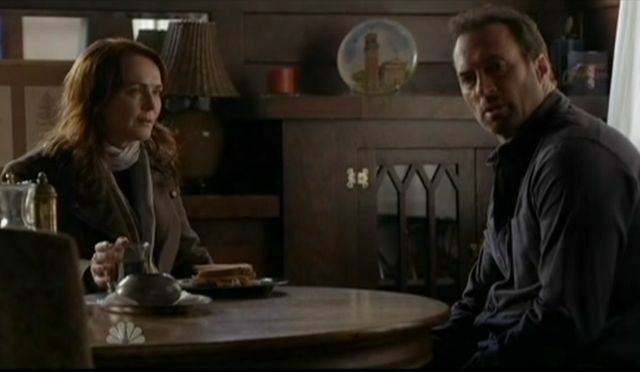 Sophia and Michael Buchanan (Scott Patterson) come into their safe house, as Sophia is complaining how Thomas played her perfectly about getting the uranium out in the open, and how he knew she would call President Martinez. They are talking about this when her cell phone rings. It is Thomas. Sophia has no desire to speak with him, but Thomas tells her “You know the message I sent back home… I got a reply and…and it changes everything.” Thomas looks pretty pained right now as he says “We can’t afford to be divided any longer” Sophia refuses to meet with Thomas and he tells her he needs to tell all of their people, in person, and he would be texting her with the meeting’s location soon, with a final comment “I’ll hope you’re there”. My thought here is that either their planet or race is in deep trouble, but at this point we don’t know if it is natural, or a warring factor back home. Earlier episodes mentioned that their world is no longer viable to sustain life, so I’m going with a “natural” disaster of some sort. Even Sophia has an ominous look on her face. This doesn’t sound good for their people. 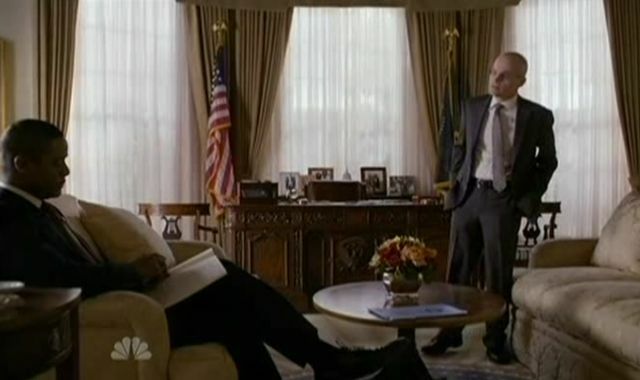 Now we find ourselves back in the Presidential office as Ray Jarvis enters, asking to put all this behind us and President Martinez is having nothing to do with it. He’s totally miffed at Ray and the Jeopardy that Ray put the lives of himself and his family in. He strikes me as one who does not forgive easily. In my opinion, President Martinez is justified. I would think in real life, the VP could be punished for a treasonous act if he ever placed the lives of the Presidential family at risk. However, Ray DOES point out that nothing is on record. In other words, “Prove it” … Of course there is no way to prove anything about Jarvis’ involvement. We have to love Hollywood and scripts, do we not? 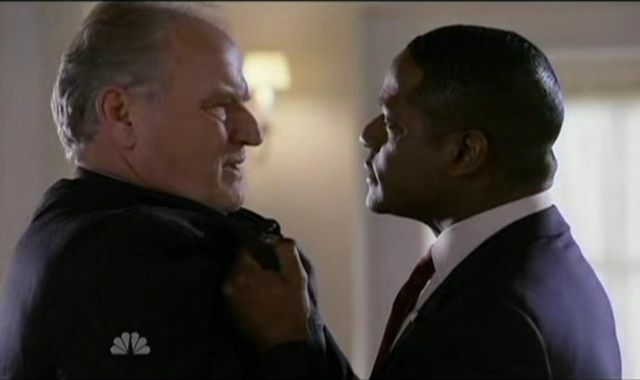 At this point, President Martinez has Jarvis in a ‘coat-grip’ looking like this will come to blows when Blake Sterling walks in with news about Sophia. Then we are on a highway, in the car with Sean and Vicky Roberts, talking about getting to the Vice President Raymond Jarvis (Bill Smitrovich). Sean instructs her “When you find signs of a place that might have internet, pull over. In the meantime, tell me about Dempsey, like the girls he’s abducted.” “Like the fact that they’re not human?” She replies. 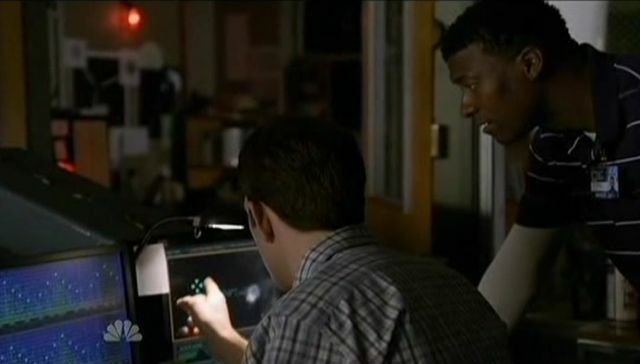 “Then you know…about the aliens?” asked Sean. She clarifies that is why Dempsey wanted to assassinate President Martinez. Blake Sterling come into the Presidential office again but this time to talk with President Martinez about Ray Jarvis and the whole mess, which the President feels HE caused. He wants to fix this himself. Blake seems to understand and leaves the President. –Although I admire President Martinez wanting to bear the full responsibility for all that has happened, I feel alienating ones’ cabinet and colleagues will not work for him. He will, in fact, need those around him. Sean Walker (Jason Ritter) and Vicky are in a diner, and Sean is on his laptop, finding out details. He tells Vicky that Ray Jarvis is back to work at the White House. Vicky says :”If you think I’m getting us into the White House, you’re crazy.” But Sean tells her Jarvis is to attend a party fundraiser at the Ambassador hotel, downtown Washington that night. Vicky asks him if he can hack into the guest list. I see they will be going for people who have already been ‘vetted’ for the fundraiser and the next scenes are of a couple, getting ready for the gala, when a knock at their door reveals Vicky, saying she had locked herself out of her room could she use their phone to call down to the lobby. As she was allowed in, Sean came in behind her, they incapacitated the couple, stole their identification badges and altered them. then, a fingerprint ‘skin’ was made for them both from the hapless couple, so they could get into the gala. Michael Buchanan is at the house where he has left Leila and Samantha in safety, bringing things from out of a car, as he prepares for the text message Thomas is sending to all of their people. 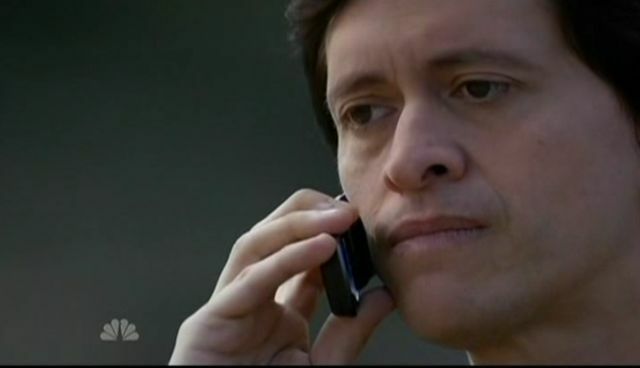 His cell phone buzzes, and he says that the meeting is in Los Angeles. His wife is hesitant about trusting Thomas, but Michael tells her they owe it to themselves to hear the announcement from Thomas. He says that she doesn’t have to go, Leila Buchanan (Sarah Roemer) and his wife Samantha (Anna Clark) should not be alone anyway. The two embrace and fade out. Sophia is also getting this message, as apparently Thomas is making good on notifying every one of their people where to meet. It is also at this point we see the military arriving on the scene, preparing to surround and take Sophia. 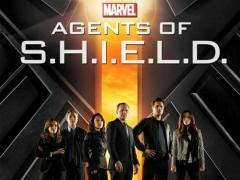 They know what Thomas’ agent did to the operator in the beginning of the episode.Sophia then says she has to go. She has no choice. 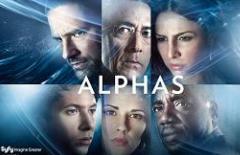 Thomas is gaining too much power over the others and she cannot allow him to solidify his power over them. 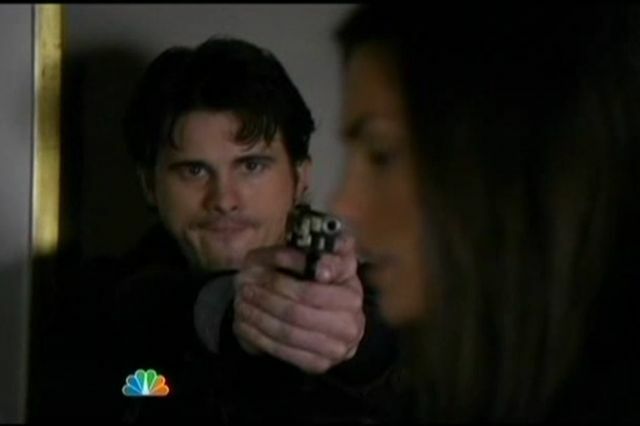 Michael reminds Sophia that Thomas already tried to kill her once. “He won’t try that again” She said “Not There. He can’t risk turning more of our people against him” Meanwhile, we also see the Military vehicles coming up toward the safe house! 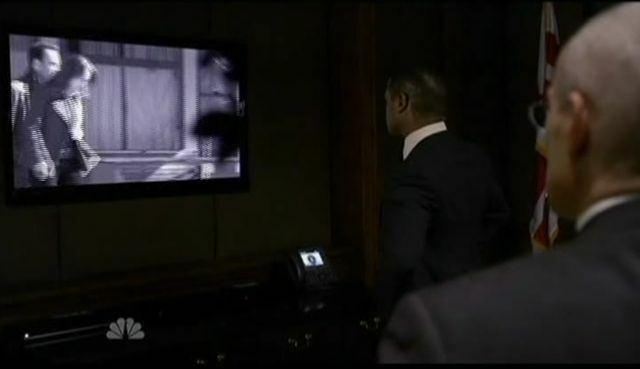 Back to the ‘War Room’ and surveillance is showing images of Sophia through the safe house’s window. The music is tense and we know outside the house there is military and presumably snipers in wait for orders. President Martinez surmises this is an anomaly and with the mass communication that went out, he has figured out they are going to a meeting. He tells the military to hold off on arresting or killing Sophia, in the hopes of ‘getting them all’. This to me, seems more beneficial if you want to stop an invasion. 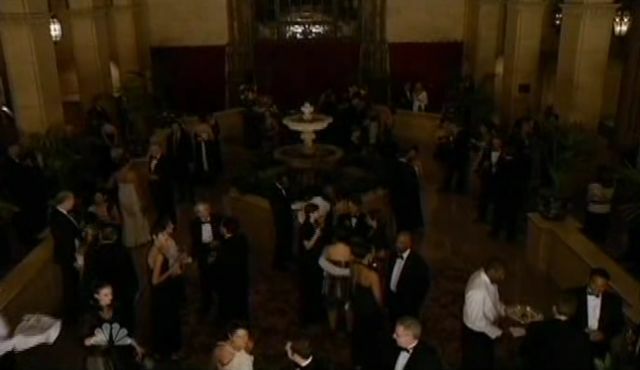 They then walk into the luxurious ballroom. 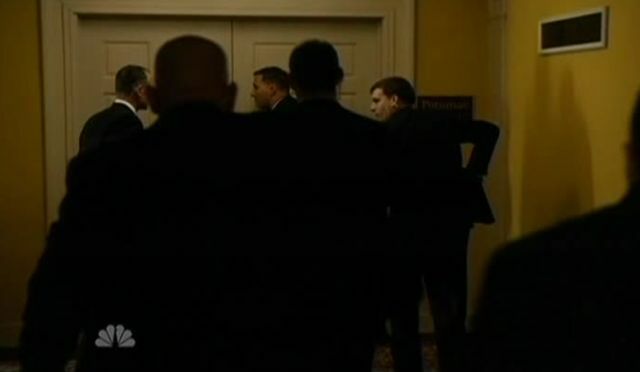 After a few introductions and so on, they get to see Ray Jarvis and Vicky has the gun out, stealth-like, and they get Jarvis into a room without the Secret service. 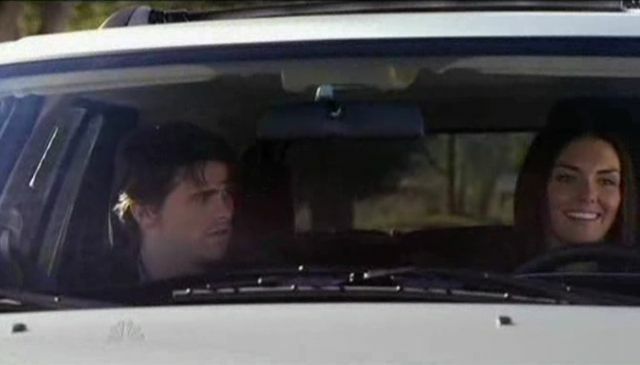 The scene goes back to the couple from which they stole the identities and the man has come to and begins kicking the door and trying to yell. Back to the private room with Jarvis, Sean and Vicky try to get information from him about Dempsey. Ray does not know. Sean tells him he has nothing to lose. Jarvis tells Sean Dempsey has left for France and other than that he knows nothing. At this point the Secret Service has been alerted to the impending threat to the VP and breaks the door down as Sean and Vicky escape through a window. 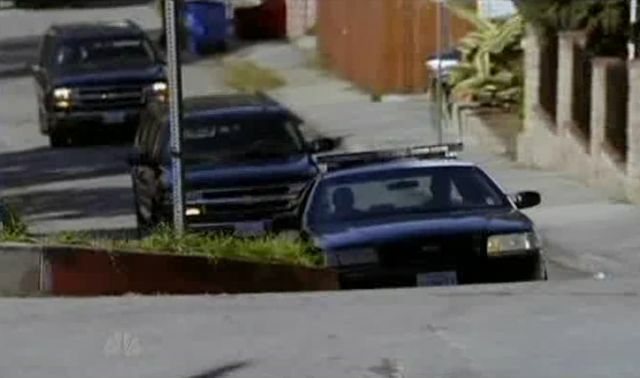 The Secret Service engages pursuit. 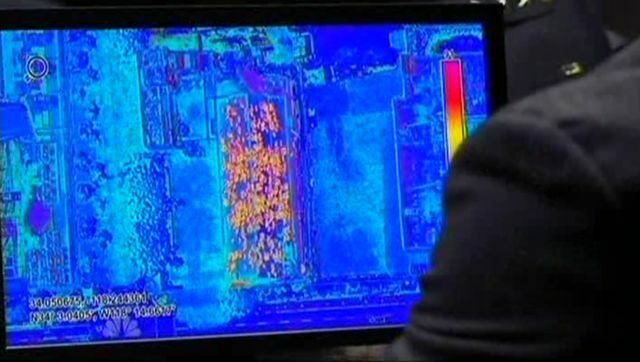 We go back to the surveillance video and Blake, President Martinez and others see over two-hundred heat signatures in a disused Cathedral. The meeting gets underway. 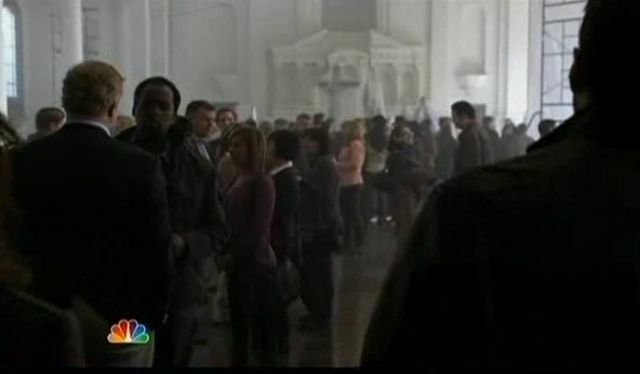 The others are all coming into the Cathedral. Thomas announces something that no one wants to hear about their home planet. Their sun has started to go Supernova. In less than a year, their world will no longer be habitable. This means Thomas’ plans are obsolete and they must now bring every one of them here to Earth. This is their last chance of survival. The government’s troops are outside, helicopters and soldiers everywhere! 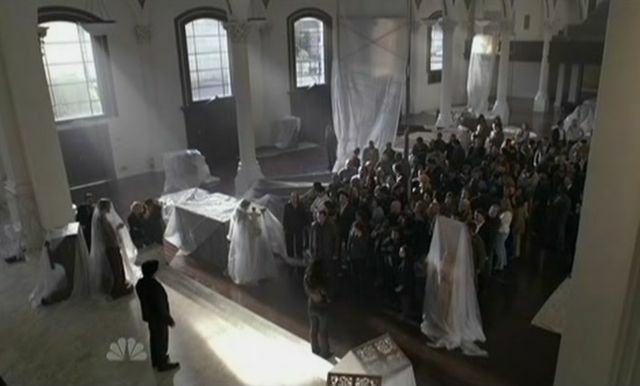 Thomas tells Sophia “The Government’s here” And amid the tense music, scenes of military and the Aliens getting this horrific news in the church, This episode ended on a cliffhanger. In my opinion, this is somewhat of a game-changer. It’s always easier to view things like Aliens from other worlds as a threat, a menace, always it seems something to be feared. I can’t help but wonder what IF disclosure had actually taken place? Disclosure by either side to the Eartheaon people may lay to rest some ideas about Extraterrestrials and what they could have planned to do here. Surely, Mankind is not so full of hubris as to believe we are the only ones with an instinct to survive? 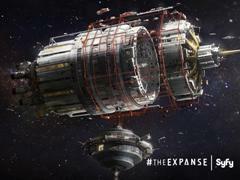 I watch shows like this and think about what it would be like if we were to actually find out aliens have lived here for the guts of 70 years, not harming anyone, really, just living, marrying and having offspring, working, paying taxes etc… What would we as a people do about this, if anything? Then maybe finding out their world is in fact going to become nothing more than a scorched, uninhabitable rock in space, could we as a species have the coldest of hearts to turn them away? I know the theme may be a little cliche, but this seems to be a recurring thing in most Sci-Fi. Usually, even the meanest of Aliens are simply here for their survival. The aliens may scare you, you may not want them here, but as they are “Alien” we should also perhaps stop expecting them to act like US. Just as we have had to do in history, we have to realize people of other nationalities and so on have the same rights as we do. Most people accept this on the Eartheaon level. My opinion is that it may be good to keep up with Sci-Fi, because … one day… we may well have to accept interplanetary ‘foreigners’ as well. 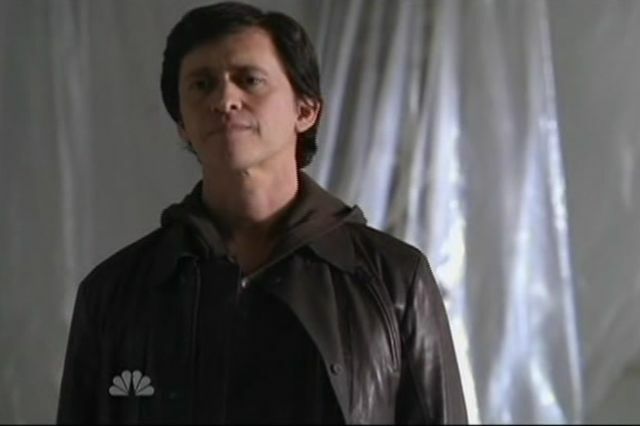 The Event returns Monday March 28, 2011 with episode 15 “Face Off”! 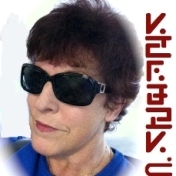 Thanks to Kenn for audio and additional embedding, and as always we appreciate your visiting our news sites at WormholeRiders News Agency. Please feel free to leave a spam free comment or a question here. I will respond to your comment or question as soon as is possible.